It’s worth it for the drinks alone! After being on a holiday diet for months, I really got my eat on on holiday. All you can eat buffet breakfast, lunch and dinner was amazing, plus bar snacks all day by the pool. And the drinks – my new favourite cocktails are Bahama Mama and Hurricane – both of which contain the Bahama favourite, rum, plus grenadine and some other random ingredients. Delish! The only thing they didn’t have were margaritas, a drink I totally fell in love with in USA, despite my dislike of tequila stemming back to an incident when I was 17 years old (the less said about that the better). Our hotel was the Breezes resort. It was fantastic value for money – the most reasonable all-inclusive resort on Nassau – and the staff were amazing. Because it was quite a small resort, we could talk to all the other guests and we made friends with people from all over the world – from Oklahoma to Australia! Ok so the famous Atlantis hotel is really pricey for a day trip and I wouldn’t say it’s completely worth the money, but when in Rome, right? We made sure we had saved up lots of spending money before we went so that we didn’t miss out on anything while we were there. At the Atlantis hotel, you can go on all the terrifying water slides which seem to drop 90 degrees and are called things like “The Abyss” – I gave these a miss, I think I had enough thrills in Orlando. There’s also the aquarium, full of creatures like sharks, stingrays, sea turtles, etc. I adore aquariums, I could look at fish all day! Add to this beautiful beaches and lovely swimming pools and you can definitely have a full day trip here. Oh, and did I mention the shops? It’s designer after designer with everyone from Gucci to Cartier. I bought a Michael Kors bag, and let me tell you – it was way cheaper than in the UK. 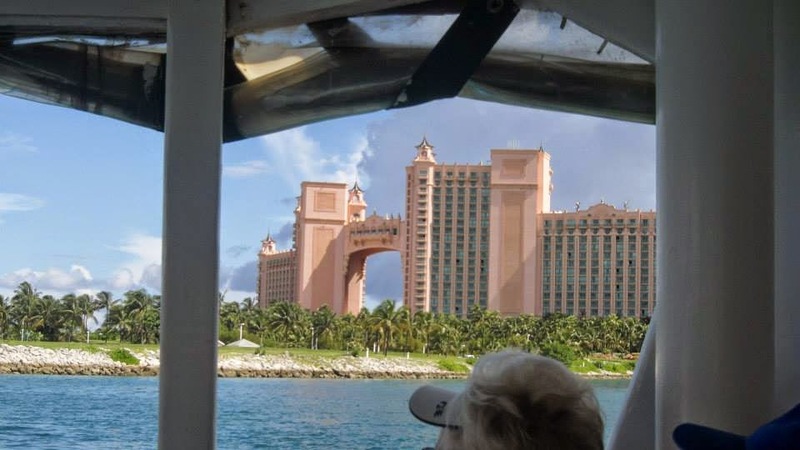 We swam with the dolphins at Atlantis, but there are a few other places you can do it around the islands. It was the second time I had been swimming with these amazing creatures – the first being over 10 years ago when I was 15 in Florida – and it was worth every penny. You get to kiss, stroke and play with the dolphins and I even got emotional at the end of it. Plus, you get to wear a very fetching wet suit – which is pretty much worth it on its own! If you go all inclusive, you also get all your watersports included. We tried kayaking and sailing, although I didn’t exactly rock the kayaking (I’ve never got better at kayaking, check out my Australian kayaking adventure here). Once I had worked up a sweat on the water, I went back to working on my tan and reading my book. After much umming and ahhing, we booked the most expensive trip that the rep showed us. And it totally did not disappoint! First of all, an hour’s journey in a power boat (not good for the hair, girls, take note) followed by feeding wild iguanas with grapes on sticks and swimming in the clearest water I’ve ever seen in my life and then back on the boat to the final destination – Exuma. Here, you feed stingrays and watch while a guy wrangles sharks before you go snorkelling. There’s a free bar all day and a delicious lunch of steaks, fish, salads and pasta – basically the whole day felt like a beautiful dream which I didn’t want to wake up from. Have you get any recommendations for things you must do in the Bahamas? Let me know in the comments! What fabulous memories, it looks amazing. Next story Guest Post: What’s in my Hand Luggage?